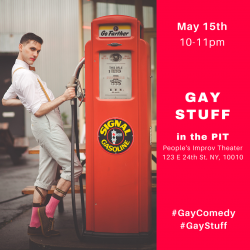 NYC acting debut -- in "Gaysplaining!" I have been (typecast) as "Chubby Hubby: a kind but clueless straight man" in my friend Jamie's sketch "Gaysplaining." What is this "gay" "splaining"? Well -- you'll just have to come out to the PIT at 10 pm to check it out. I met Jamie (and a lot of the fellow cast) in an Improv class at the PIT -- where I am continuing to explore my actor side, on my way to Saturday Night Live (I would think). I'm currently in Level One (those in Jamie's sketches were together in Level 0) -- and really starting to make waves in the world of NYC improv and theater. I think that Spencer Tracey got his start in improv at the PIT (People's Improv Theater). All images and text on this site are copyright ©2013 by Tom Block Arts. Please contact the artist for use of these images and/or writings.